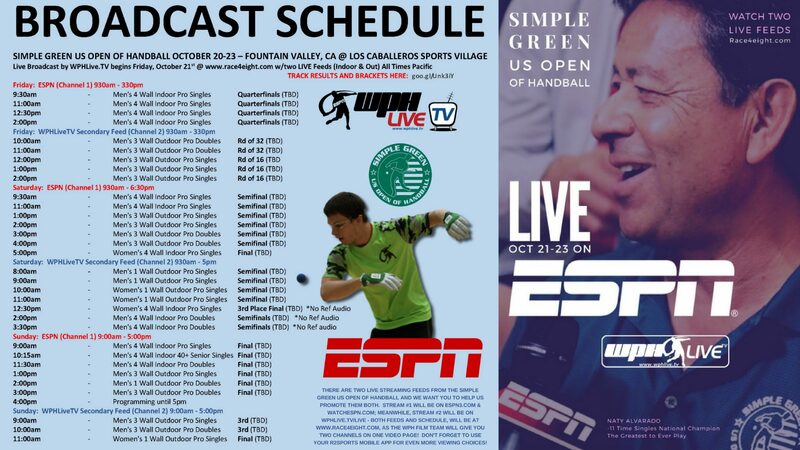 A Secondary Handball Video Feed Headlines This Year’s Mega-Event – The Simple Green US Open of Handball & WPH Race4Eight Professional Handball Tour, Stop#1 (October 20-23), is powered by ESPN3 & the WatchESPN App! Please Watch, Share and Support the game by forwarding this schedule along to your list of friends, post on social media and help us grow the game of handball. All of the action will be at the bottom of the page at www.race4eight.com, and the broadcast schedule will be updated daily.